Indian Society for technical Education(ISTE) was founded in the year 1967 with a mission to formulate the general goals & responsibilities of technical education and to enhance professional ideals & standards. 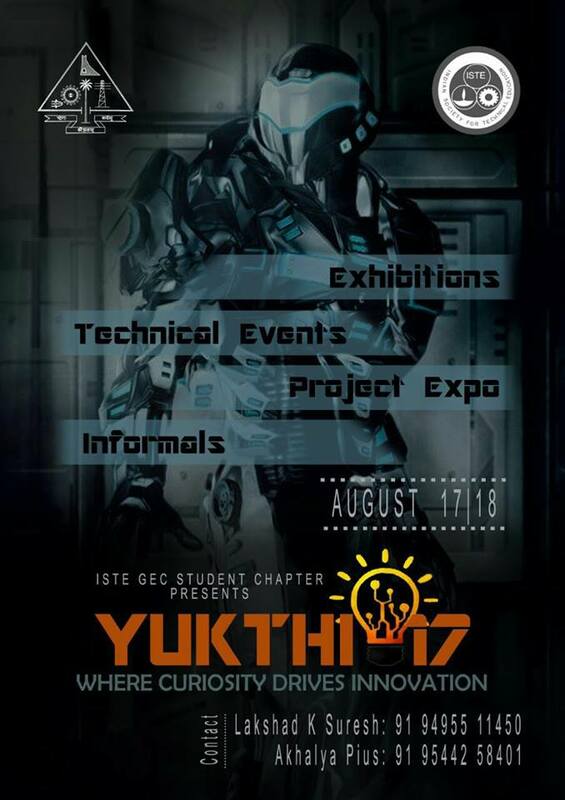 ISTE Students’ Chapter of GEC, Thrissur , in association with the Diamond Jubilee Celebration of Government Engineering College, Thrissur, organizes YUKTHI 2017, Project Expo, on 17th &18th of August to set those inquisitive, innovative young minds on fire. YUKTHI 17- Where Curiosity Drives Innovation!!! Imbibing the true essence, this YUKTHI presents a great platform for all those young minds( schools and college students) to rack their brains and come up with innovative projects and to bag cash prizes for the best projects.YUKTHI also presents Science and technology expos ,workshops and various other technical and informal events.This is novel venture by ISTE GEC chapter to delve deep into today’s science to forge better engineers for tomorrow. Yukthi 17 presents an exhibition of emerging technical and technological ideas all in one place. There will be projects from Kerala State Electricity Board( KSEB), Energy Conservation Society ( ECS) and other such organizations. There will also be a project competition for school students on the theme ” Taking India tech years ahead ” on 17th August. There will be technical project competition for engineering students on18 th August. Best projects will be awarded prizes worth Rs 15000. 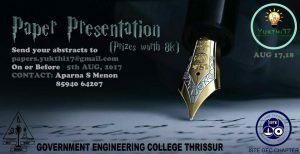 Paper presentation competition as a part of Yukthi 2017 brings the budding engineers the opportunity to bring their ideas to light. Interested candidates can pitch their ideas onto paper and submit for evaluation to yukthi.iste@gmail.com on or before the 5th of August. Best ideas will be chosen for presentation at Yukthi 2017 where they get a chance to present their idea to public. Be the best and stand a chance to win prizes worth Rs 8000. Yukthi 17 presents Line follower, the most popular robotics competition in Indian campuses. Design a line follower robot most efficiently to complete maximum checkpoints in the least time and win the competition. All line follower rules apply. The winner stand a chance to win prizes worth Rs 5000. 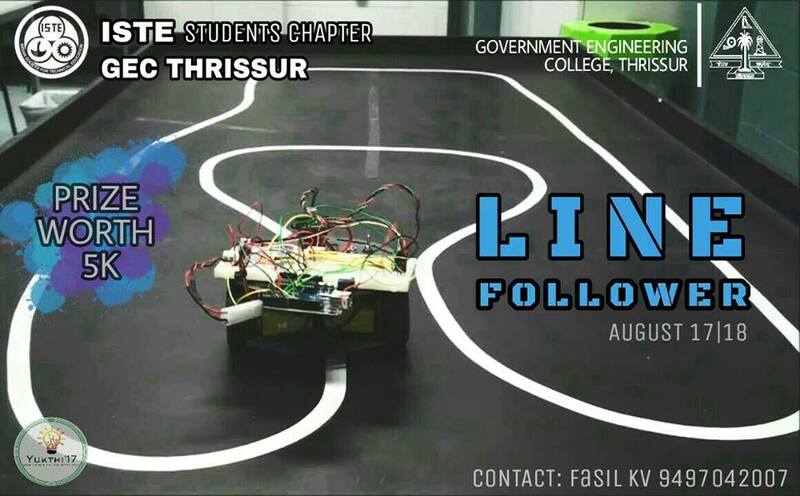 Yukthi 17 presents you Line follower, the most popular robotics competition in Indian campuses. Design a line follower robot most efficiently to complete maximum checkpoints in the least time and win the competition. All line follower rules apply. The winner stand a chance to win prizes worth Rs 5000. Other events include science and technical quiz , Technovision and informals. The Indian Society for Technical Education GEC Students Chapter is hosting VIVIKTHA ’15, the annual state convention of ISTE in our college. Colleges from across Kerala have been invited for this tremendous event. Centred on the socially relevant theme ‘bridging the gap between urban and rural India through technological advancement’, the convention aspires to incite in participants the perennial desire to strive towards dissolving the aforesaid disparity. The convention will be inaugurated by Dr. Shivan,Director of Vikram Sarabhai Space Centre. A workshop on Solar and smart energy systems which will be handled by Roboversity -an IIT Kanpur initiative – co-sponsored by Kerala State Council for Science, Technology and Environment is scheduled to be conducted in our college on 12th and 13th of September 2015 as a part of Viviktha, which is a harmonious medley of technical and general events – The real engineer ’15, Chakravyuha, paper presentation, Ariadne-the treasure hunt ,project presentation ,technical and non technical Quiz, Debate, SherLOCKed, The machinist, Scrap ninja, crazy bulbs, Let’s wire, Electropoly, Circuit debugging, Brahmarika, Bascule, A.out, Quimino la aventura and Robowar. Participants can rest assured that they will get to partake in a variety of events which will definitely be an invigorating experience. ISTE Students’ Chapter of GECT is one of the most reputed Student ‘s Chapter in Kerala and boasts of a strength of 2417 members. The Chapter has taken keen interest in helping its members interact with eminent personalities from various fields of technical education and has regularly given them an opportunity to demonstrate their technical skills. The ISTE wing of GECT has regularly bagged the Overall championship at the annual Students’ Convention of ISTE Kerala Section, with the latest championship being bagged at the 13th Annual State Level Convention held at Mar Baselios College Of Engineering And Technology on the 29th and 30th august 2014.The chapter played host to the Annual convention in 2012.Organized under the title ‘VAIBHAVA’ the event attracted over 1000 participants from more than 70 colleges. The Chapter has also bagged the Best Students’ Chapter Award in ISTE Kerala Section in the year 2008-09 at the 12th Annual Students’ National ISTE Convention held at Bannari Amman Institute of Technology, Sathyamangalam, Tamil Nadu during 3rd and 4th October, 2009.The achievements and accomplishments of the Chapter stand as a testimony to the hardwork and dedication of its staff and student representatives. 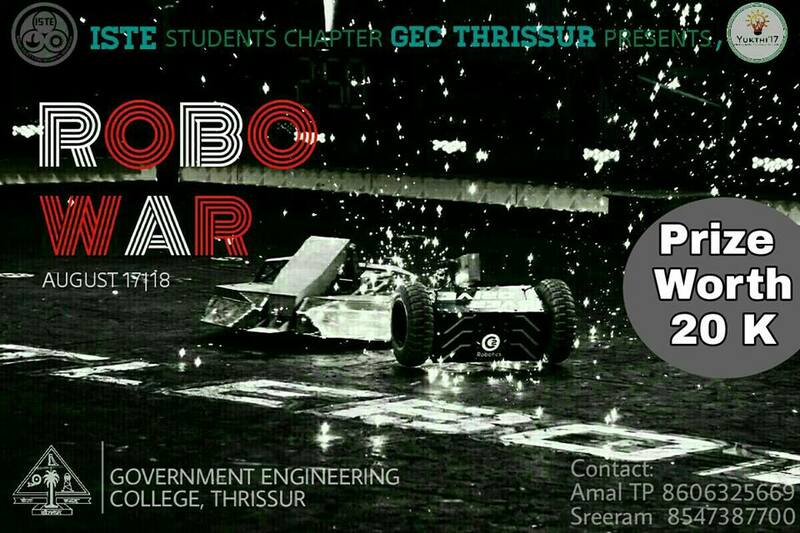 The recent events of the Chapter include Yukthi,a project expo which showcased the most innovative and creative projects done by the students from various schools and colleges across Thrissur and Lumino, a team-wise competiton that explored the technical skills of the participants. The chapter also provides GATE Coaching for final year students of colleges in and around Thrissur with an intake of 30 students in each branch. ISTE Students Chapter of Govt. 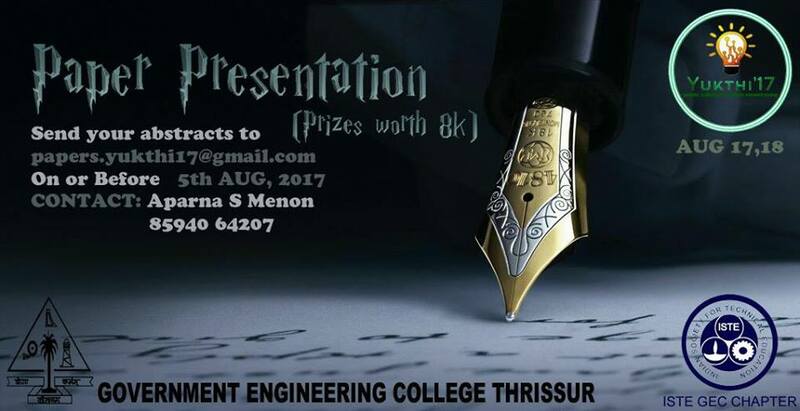 Engineering College Thrissur has organized Project Expo YUKTHI-13 at Millennium Auditorium of the college on 26 July 2013, depicting the creativity and the spirit of innovation in the student fraternity. Apart from these, there were stalls which arrayed sophisticated equipment/models from KSEB, BSNL, Hykon India (P) Ltd. etc. Prizes were awarded to the best project from each department as well as the Overall best project in the total lot. The students’ chapter of ISTE, GEC, and Thrissur conducted the ISTE-SREENIVASA RAMANUJA MATHEMATICS COMPETITION of 2013. The chapter level examination was conducted on 30th August in which more than 100 students and 20 teachers participated, all belonging to GEC, Thrissur. 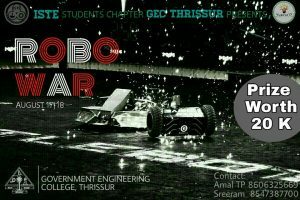 The ISTE Students’ Chapter of GEC, Thrissur conducted another colourful event LUMINO ’14- THREE HURDLES, ONE RIDE TO GLORY, on 25th March 2014. Receiving about 40 registrations and total of 200 students, the event turned out to be a huge success. Thus the three rounds tested the technical, innovative and managerial skills of the participants. The expo was a brilliant display of the innovative and brilliant projects of students of GECT. Around 2400 students attended the event. Anju S (S6 EEE) won a consolation prize of Rs. 2000 in the national level and also a cash prize of Rs. 5000 in the zonal level bringing pride and honour to our college. Abhi Aravind T A was awarded the ‘best student’ for the academic year 2012-2013. Arun K Devadas was awarded the ‘best student’ award for the academic year 2013-2014. Our chapter won the ‘Best Chapter’ Award for the academic year 2013-2014.